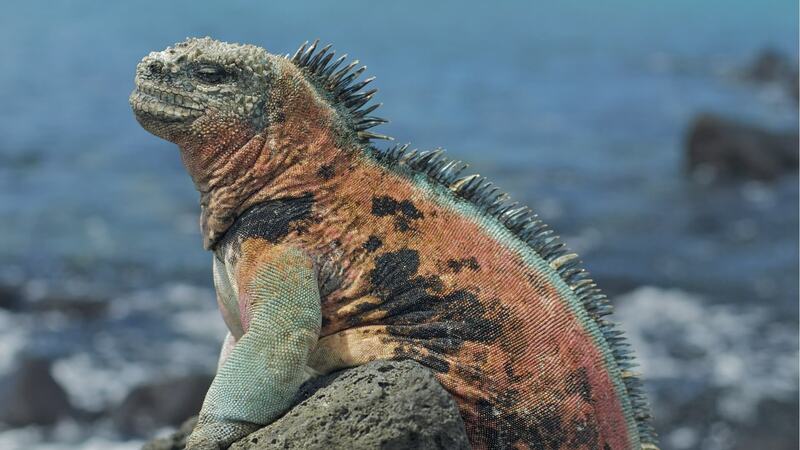 Galapagos marine iguanas are the world's only sea-going lizard - wonderfully adapted to the marine environment. Discover their fascinating evolutionary story. Teachers, click here for lesson plans and resources! What is a Marine Iguana? …hideous-looking creature, of a dirty black colour, stupid and sluggish in its movements. Marine iguanas are able to dive to depths of 25 metres and can remain submerged for well over 10 minutes before having to return to land to warm up. They can often been seen basking in the sun on exposed lava to raise their body temperature to around 35.5°C. Did you know that marine iguanas sneeze salt out of their nostrils? This strange adaptation has evolved to get rid of the excess salt which they ingest due to their marine diet.